Need a study break? 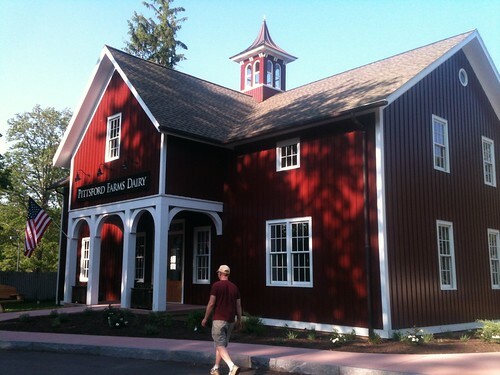 One of my favorite ice cream places near campus is Pittsford Farms Dairy. They are located in the heart of Pittsford on North Main Street right near the canal. Pittsford Dairy was established in the late 1800s and continues to be a family owned business, but it wasn’t until 2012 that they opened up their bakery and ice cream parlor. Not only does Pittsford Dairy serve creative flavors of ice cream but they also produce milk, chocolate milk, eggnog, fresh butter, and baked goodies daily. So if you are not in the mood for ice cream, there is always something to enjoy. Pittsford Dairy has the nicest staff. They are polite and willing to give you the best experience. They always allow you to sample any flavor you want beforehand to make sure it is the one you want. Once you have found your ice cream treat, there are multiple spots where you can sit and eat. You can enjoy your ice cream treat with friends and family inside at one of the numerous tables offered, or take it outside and walk the scenic land they have. I always prefer to walk down to the canal with my ice cream – especially when it is a nice, sunny day out and I’m with friends. Pittsford Dairy is open 7 a.m. – 9 p.m. Monday through Sunday, except for special holidays and some seasonal hours. Danielle is a senior business administration major at Nazareth College of Rochester with minors in entrepreneurship and information systems. She has been a member of the Golden Flyers Women's soccer team for the past four years and is now a current writer of the Golden Gazette. Danielle is a native to Rochester, New York who has interned locally at Bob Johnson Chevrolet and eHealth Technologies. She is graduating in May 2016 and is seeking a job in the business field. Danielle loves to stay active through soccer and running and has a passion for dogs.